FFA - Gannett’s USA Today applauds Sharia in America. Twitter and Facebook links posted below. 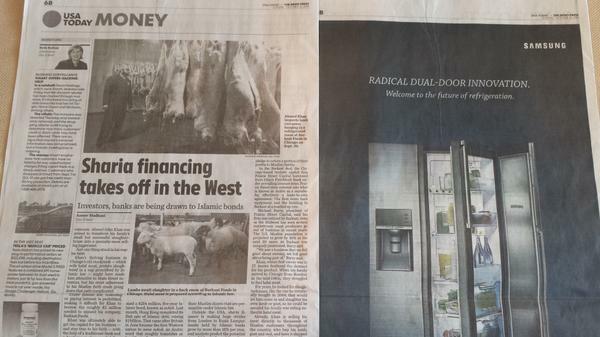 USA Today published a headline story in their Sunday, October 12, 2014 Money section titled “Sharia financing takes off in the West.” A full page Samsung advertisement paid the way for USA Today to publish this rubbish. Click on the below photograph to enlarge. The article reports that Ahmed Khan wanted to expand his Halal only meat company, Barkaat Foods, in America. However, Khan’s “strict adherence to his Muslim faith” would not allow him to obtain a traditional American loan. He needed a loan that would comply with Islamic Sharia law. Prairie Street Capital invested the money in Barkaat Foods that Khan needed to expand. Michael Barry, president of Prairie Street Capital said “The U.S. Muslim population is projected to grow by 35% in the next 20 years, so Barkaat was uniquely positioned. We saw a business that we felt good about owning, we felt good about being a part of.” Prairie Street Capital is also invested in Glass America, MilesTek, Weld Racing, Copperfield, Pyramid Industries, Intech Edm and Xycarb Ceramics. So USA Today wrote a glowing headline article that clearly applauds an American business for providing Sharia compliant funds to a company that sells Sharia compliant Halal meats. Does USA Today and Prairie Street Capital not know that instead of Muslims assimilating in America and embracing the United States Constitution they are holding on to Sharia law which governs twenty five countries (Muslims and non-Muslims)? Does USA Today and Prairie Street Capital not know that Islamist leaders are calling for America to be ruled by Sharia law? Omar Ahmad, Chairman and founder of the Council on American Islamic Relations (CAIR), told a Muslim crowd Islam isn't in America to be equal to any other faiths, but to become dominant. The Koran, the Muslim book of scripture, should be the highest authority in America, and Islam the only accepted religion on Earth. Islamic Society of North America (ISNA) founder and former Secretary-General Sayyid Syeed was recorded in 2006 as saying, “Our job is to change the constitution of America.” It is the Islamist mission to institute Sharia law as public policy in the United States. USA Today certainly has the right to choose the reports that they publish. Prairie Street Capital has the right to choose the companies in which they invest. Samsung has the right to choose the mediums in which they advertise. You have the same right to voice your concerns and choose to patronize companies that won't advocate for Sharia law in the United States. Florida Family Association has prepared an email for you to send to voice your concern to officials at Samsung, Gannett and Prairie Street Capital. 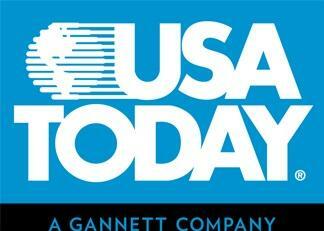 USA Today Gannett’s USA Today applauds Sharia in America.